Kidney, Renal tubule - Crystals in a male B6C3F1 mouse from a chronic study. There are crystals (arrows) within tubule lumens. 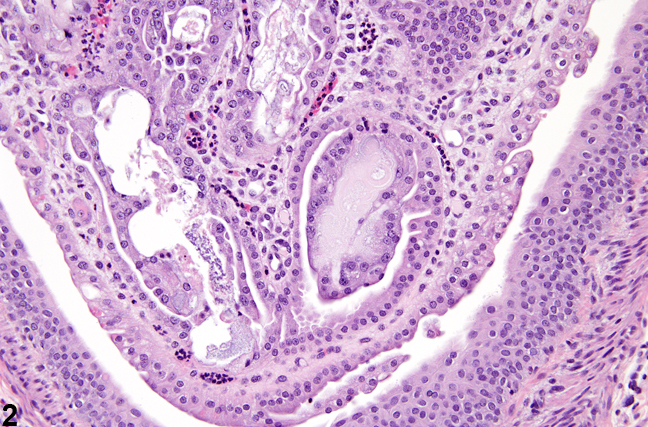 Kidney, Renal tubule - Crystals in a male rat from an acute study. 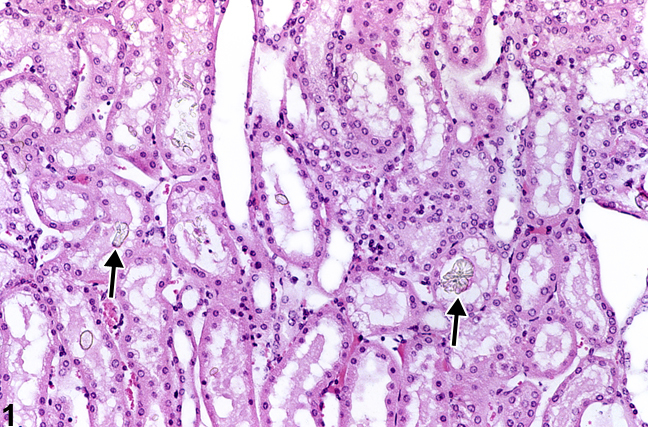 Crystal deposition with secondary inflammation is present in the renal papilla. Kidney, Renal tubule - Crystals in a female F344/N rat from a chronic study. 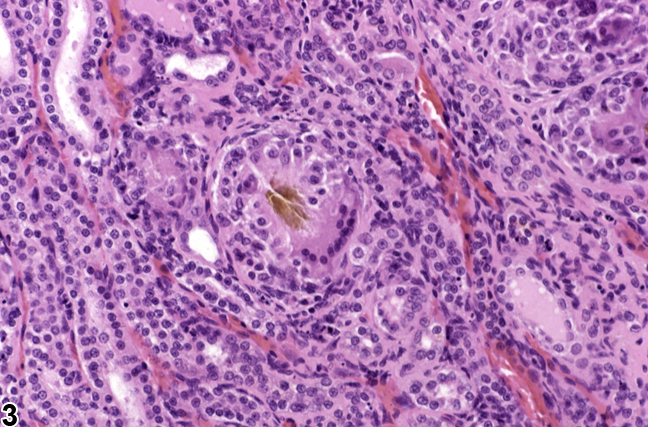 A pigmented crystal is surrounded by multinucleated giant cells. 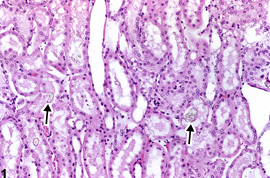 Crystals can occur in any of the renal tubule segments or renal pelvis ( Figure 1 and Figure 2 ). Crystals are often difficult to find with routine light microscopy because they are often washed out in tissue processing or are optically inapparent. The presence of crystals may be better visualized with polarized light as they are often birefringent. Mineralization, on the other hand, is not birefringent. Crystals resulting from the administration of chemical and/or metabolites may precipitate in any segment of the nephron because of the concentration and pH of the urine filtrate. In addition, a number of chemicals are insoluble when certain conditions are present in the kidney. Many crystals are highly irritating, depending on their size and shape, and may result in tubule degeneration and/or necrosis and subsequent acute to chronic inflammation or pyelonephritis (see Kidney - Nephropathy, Obstructive). 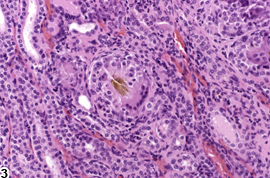 Occasionally, crystals may be identified within macrophages or multinucleated giant cells ( Figure 3 ). Crystals should be diagnosed and given a severity grade whenever present. 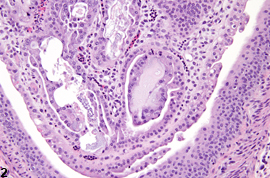 The location of the crystals should be included in the diagnosis as a site modifier (e.g., renal tubule or pelvis). The features of the crystals should be discussed in the pathology narrative. Secondary lesions, such as inflammation, should not be diagnosed separately unless warranted by severity, but should be described in the pathology narrative. Frazier KS, Seely JC, Hard GC, Betton G, Burnett R, Nakatsuji S, Nishikawa A, Durchfeld-Meyer B, Bube A. 2012. Proliferative and non-proliferative lesions in the rat and mouse urinary system. Toxicol Pathol 40:14S-86S. Hagiwara A, Asakawa E, Kurata Y, Sano M, Hirose M, Ito N. 1992. Dose-dependent renal tubular toxicity of harman and norharman in male F344 rats. Toxicol Pathol 20:197-204. Yarlagadda SG, Perazella MA. 2008. Drug-induced crystal nephropathy: An update. Expert Opin Drug Safety 7:147-158.